Years ago when we moved in to our house one of the existing accoutrements in the back yard was that of a couple of bird houses. Not knowing anything about feeding our little avian friends, my wife and I just let them sit attached to the fence where they remain to this day, and each Spring a pair of little birds (I have no idea what kind) makes a nest in each small little wooden dwelling. This year I wanted to try something new so I found some plans online for making bird houses of our own. My boys, ages 5 and 3, thought this would be a cool idea and it also gave me a chance to use some power tools which is always a good thing. I searched many websites and finally found these simple plans for a Blue Jay house which I tweaked a little to fit my own preferences and materials. Originally my boys and I made a house based on those plans but using some spare pickets that have been sitting in the corner of our yard ever since we bought the house. Though the lumber wasn’t decaying, it was rather brittle and we soon realized that it was not at all suited for any type of construction because it simply split apart whenever we drove screws into it. Even with pilot holes. Yeah…not good. So we went to the hardware store and got some 6′ by 5 1/2″ fence pickets for about $1.60 each, a box of 1 5/8″ deck screws (the self-tapping kind which don’t need pilot holes. Whee!) and set to work to make what you see in this picture. It took another few prototypes before we got comfortable with the final product, and our kids were really happy with how things turned out. We tried spray painting one of the prototypes so we could decorate it, but that proved to be somewhat of a fruitless endeavor because the wood soaked up so much paint that multiple coats would be required after which my finger really got sore from pressing the nozzle on the paint can :) For these two bird houses, our boys just got out some crayons and made drawings on all sides which is what you’re seeing in the picture. According to my oldest son the illustration here is a rainbow, and I thought it would make for a fun picture that would recall some special memories long after the wood decays and the color fades away. Ever since my boys were little I’ve tried to involve them in handyman projects, from replacing outlets to painting walls to cutting down trees. I don’t let them use some of the bigger tools in my garage like my table saw or miter saw, but they do enjoy getting their hands dirty with other tools like my drill and sander, and then cleaning things off with the air compressor. 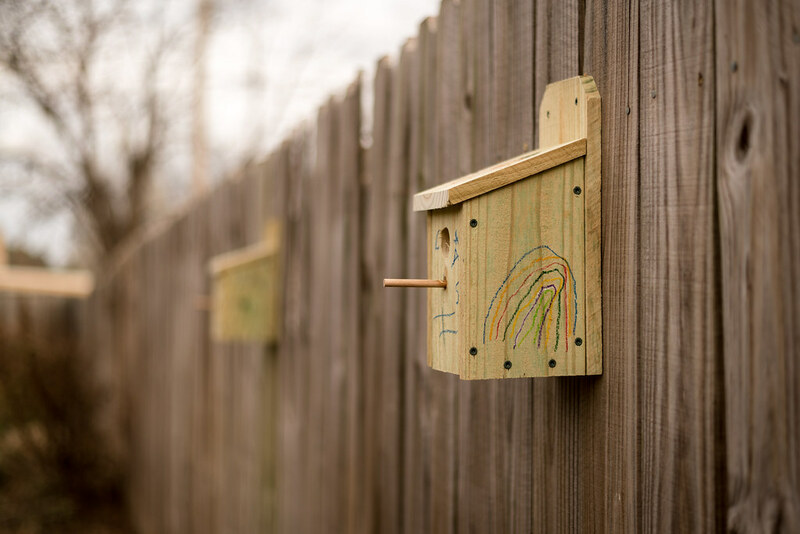 Hopefully projects like these bird houses will help show them that they can use their own two hands to create objects that are beautiful, functional, and help others–even if it’s just our small little feathered friends. Now all we need is a blue canary to inhabit these things. Maybe I can find one in the outlet by the light switch. What a wonderful way of involving your boys in projects to help them gain skills and confidence while providing you with an excuse to do some photography and preserve the memories. Preserving those memories with photographs will help them always remember that experience together. It is always fun to use your photography skills to preserve a memory in a way that is more than just a snap shot. You do a great job. According to my oldest son the illustration here is a rainbow, and I thought it would make for a fun picture that would recall some special memories long after the wood decays and the color fades away. The most important words of your entire explanation: Special memories are what keep most of us living to see what happens next. You will now have to watch the houses and see when the birds are busiest. Then camp out with your camera and a telephoto lens and try to catch photos of the birds in their new homes. Shot through the kitchen window. Remove the screen, clean the glass and attach your zoom lens. That’s how I do it. I have feeders 6 feet off my living room picture window that make for some great close up shots. You could also set the camera on a tripod and use a remote shutter release as you sip coffee in the kitchen.